Our Club announces the new opportunity for obtaining "Club Champion" titles for its members. These titles won't provide the dog with the right to be entered into champion class, these titles are only given to appreciate the results of our members who are having successes with their dog at our Club's events at a regular basis. These titles only available for the members of our Club: the Társasági Kutyások Kynológiai Egyesülete (TKKE). 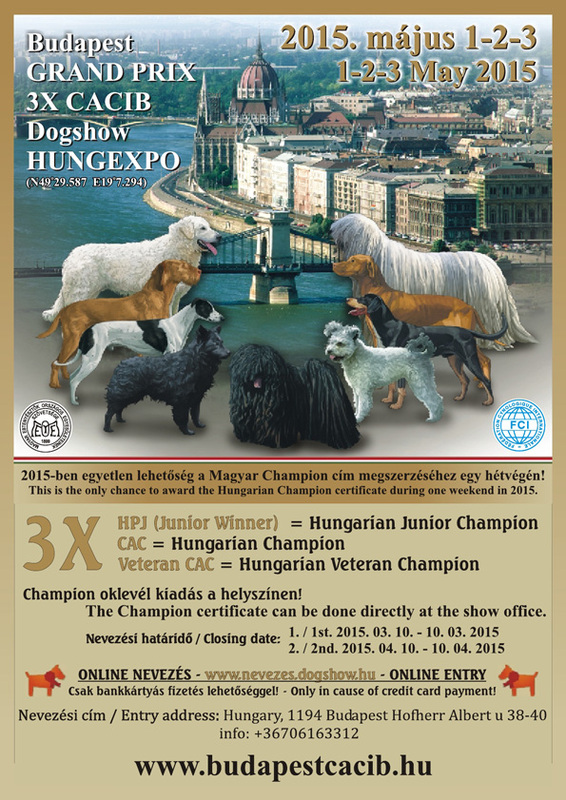 The dog has to win 3 HPJ titles between the age of 9-18 months, from which 2 is obtained at our TKKE shows, and one at a MEOESZ (Hungarian Kennel Club) show in Hungary, from minimum 2 different judges. 1 HPJ title can be substituted by a CAC title, if the dog is under the age of 18 months at the time of getting this title. 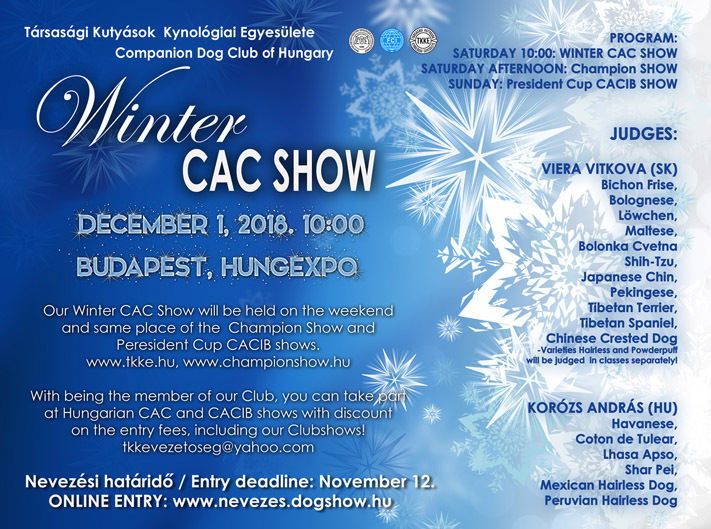 The dog has to win 4 CAC titles in intermediate or open or champion classes, from which 2 is obtained at our TKKE shows, and 2 at MEOESZ (Hungarian Kennel Club) CACIB shows in Hungary, from minimum 3 different judges. * There is no time limit to obtain the titles. The dog, who has the TKKE Club Champion title already, has to win 3 winner titles in champion class at our TKKE shows, from minimum 2 different judges. 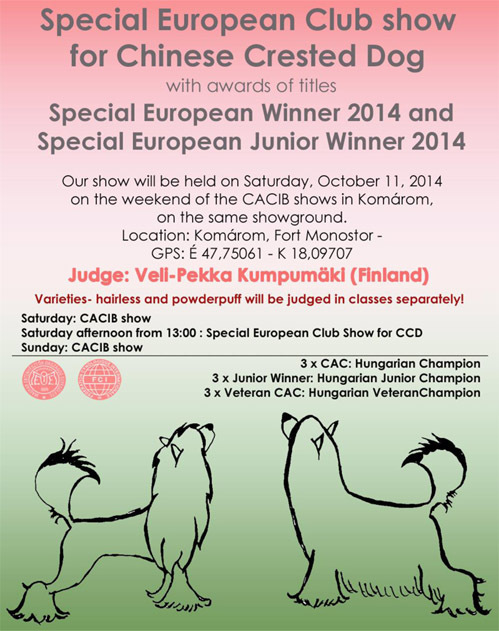 The dog has to win 3 CAC titles in veteran class, from which minimum 1 is obtained at our TKKE Clubshow, or at a MEOESZ (Hungarian Kennel Club) CACIB show in Hungary, from minimum 2 different judges. By posting to the TKKE mail address or personally at our events. The price of the certificate is 15 euro. The copy of the pedigree of the dog, the copy of the judgement sheets and cards that proove the obtaining of the titles, copy of the membership card, and a filled out requirement document. 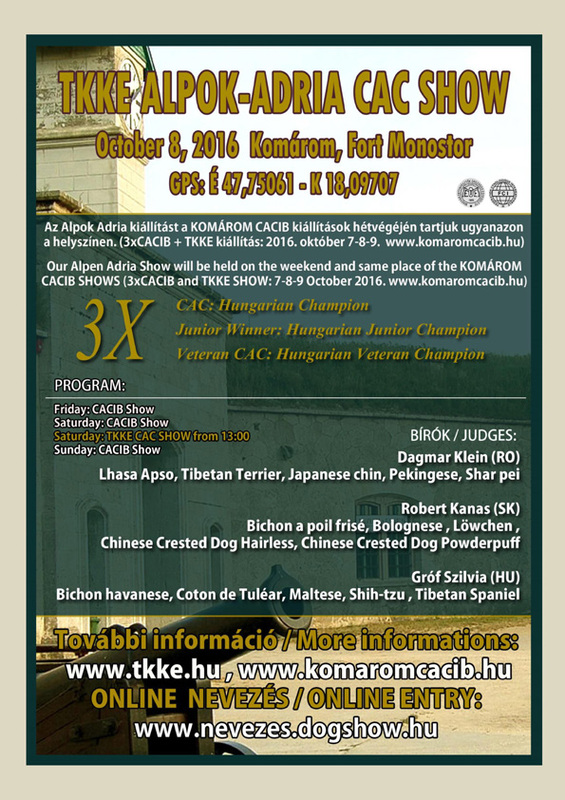 on the weekend of the CACIB shows in Komárom, on the same showground. 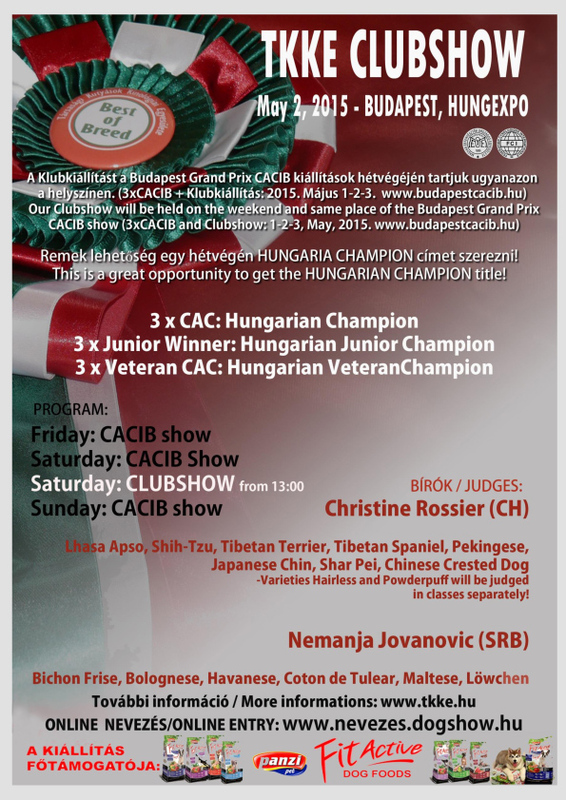 This is a great opportunity to get the Hungarian Champion title! There will be a huge tent for the exhibitors, partly covering the rings as well. Please do not place your own tents under this big tent, but place your tents to the uncovered areas, leaving a 2 meter free path around the rings. Please collect your garbage and wastes (including doghair and faeces) into the waste baskets placed at the showground. You can enter your dog(s) to Couples, Breeding Groups and Junior Handler competitions on the showground from 13:00 at the Show Office of TKKE. The operator of the showground charges 1000 HUF for parking. You can enter the showground from 7:00. There will be cafes, buffets and toilets operating at the show place, but we would also like to ask you to take care of your and your dog's needs the proper way. We wish you a wonderful day and lot of success at the show! The right of change of judges is obtained by the organizers! Please use primarily our ONLINE ENTRY system! Entries by email can not be accepted! ATTENTION! In case of bank transfer an additional 4 EUR/dog must be paid for the bank expenses. In case of cash payment on the day of the show, an additional 10 EUR/dog must be paid. 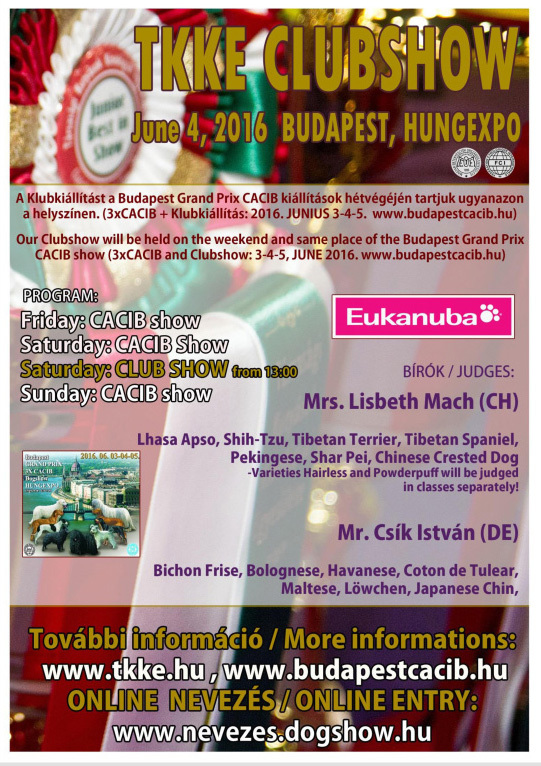 hungarian CAC and CACIB shows with discount on the entry fees (including our Clubshows)! on the 17th of May, 2013 on the weekend of the World Dog Show: http://www.wds2013.hu/. 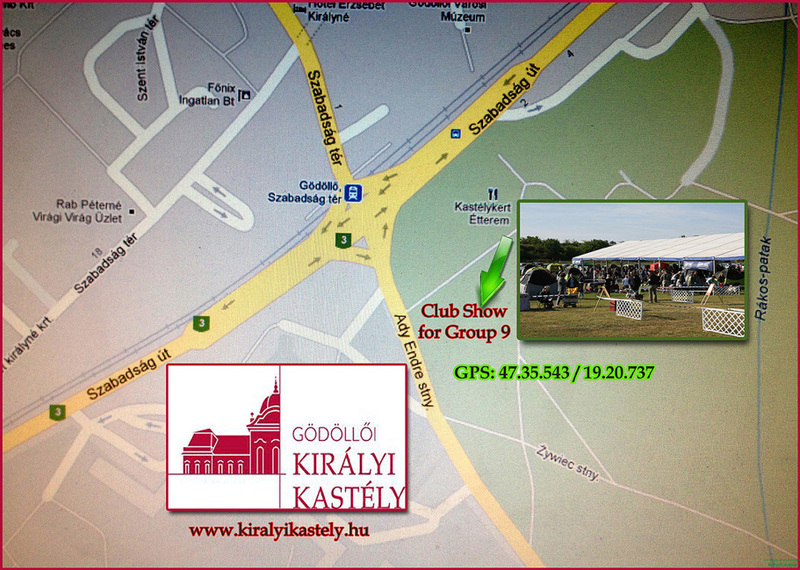 On the map below you can see that the rings for the TKKE Clubshow will be placed across the main gate of the Castle of Gödöllő, on the opposite side of the road, in the park behind the Ady Endre street. You can enter your dog(s) to Couples, Breeding Groups and Junior Handler competitions on the showground from 10-13:00 at the Show Office of TKKE. The operator of the Castle charges 1000 HUF for parking. There will be cafes, buffets and toilets operating at the parks and the Castle, but we would also like to ask you to take care of your and your dog's needs the proper way. Entry deadline: 2013.05.05. ONLINE ONLY! In case of sending entries by post: 2013.04.29.